Durango Silver Co has been dealing in Native American Indian Jewelry for nearly 40 years now, all of our handcrafted 925 Silver Jewelry is made in the USA. We handle quality Native American Indian Jewelry here in Durango, Co USA and we deal in Native American Silver Jewelry which is made in our immediate vicinity. We have mined and collected high quality American Turquoise for over forty years and are proveyors of one of the largest quality American Turquoise collections in the world. We have Native American Indian Jewelry made with our fine Turquoise and have some of the best Native American Indian Jewelry coming out of the Southwest today! In the photo above is a beautiful piece of Native American Indian Jewelry, a modern rendition of a Native American Squash Blossom Necklace, but, without the squash blossoms. This Necklace was Navajo Indian hand crafted in Sterling Silver with Turquoise from the Manassa Turquoise Mine which has become very scarce as the mine stopped producing about 20 years ago. 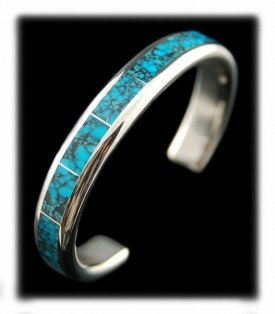 Native American Indian Jewelry made with rare Turquoise brings a premium and is highly collectible. We invite you to check out the Native American Indian Jewelry we have available by following the links to the left side of this page. Above and to the left is a Fox Turquoise Necklace and Earring Set hand crafted by Native American artist Verdy Jake. This Fox Turquoise Necklace features 21 freeform shaped blue Fox Turquoise cabochons. The Turquoise Earrings feature four freeform shaped Turquoise cabochons. All of the Turquoise cabochons in this Turquoise necklace and earring set were cut from an old batch of Fox Turquoise from our collection, it was mined in the 1960s. Each cabochon is one half of a natural Fox Turquoise nugget. 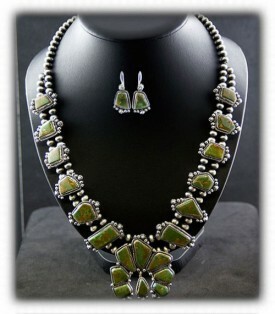 A great example of Native American Indian Jewelry! To the right is a pair of Coral and Turquoise Earrings that were made between 1950-60 by the Quam family of Zuni Native American Indian Jewelers. This has been a popular design for many years, it is not typical for Zuni Indian Jewelry, however, you can see the lapidary work is what Zuni Artisans are known for and unique lapidary work is displayed in this Native American Indian Jewelry by the Quam family. Durango Silver Co has dealt in Antique Indian Jewelry for decades and often has a great selection on Antique as well as Vintage Indian Jewelry available. Check out our presentation on the Fort Defiance Trading Post purchase that we make in the 1980's. Above and to the right is a Turquoise Inlaid Native American Indian Bracelet hand crafted by Native American artist Larry Loretto, a Zuni Indian Artisan. This spiderweb Turquoise Inlay Bracelet is a show stopping piece of handmade Native American Indian Jewelry as it won an award at the Gallup Indian Ceremonials in 2011. Top of form, slim, colorful and high quality, this beautiful Spiderweb Turquoise Bracelet was inlaid with gorgeous Tibetan Turquoise.. This bracelet features a simplistic heavy silver design that is inlaid with high grade natural rich blue spiderweb Tibetan Turquoise around the entire bracelet. 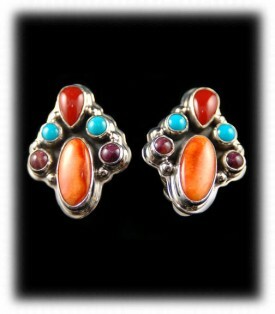 Fabulous pieces of Native American Indian Jewelry such as this piece can be found at our online Silver Gallery. To the right above is a Native American Indian handmade Zuni Inlay Ranger Belt Buckle set. It was hand inlaid with Sleeping Beauty Turquoise, Mediterranean Coral, Jet and Mother of Pearl by Zuni Artisan's Don and Viola Eriacho. This ranger buckle set features consists of a buckle, two keepers, and a tip. The color combination is outstanding and very attractive when worn. This Ranger Belt Buckle set is made from heavy weight 925 Silver, it has a bead and sunburst design. Above and to the right is a beautiful piece of quality Native American Indian Jewelry by Navajo Artisan, Edison Yazzi. This is a wonderful Spiny Oyster Shell Inlaid Bracelet by Edison Yazzi. 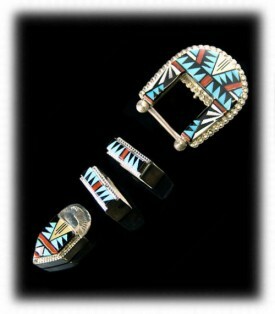 It is inlaid with orange Spiny Oyster Shell, Black Jade and Sleeping Beauty Turquoise by Native American artist Edison. Bold designs and Edison’s signature round inlays of orange Spiny Oyster shell is the focal point of this eye catching inlaid bracelet made for a gentleman. 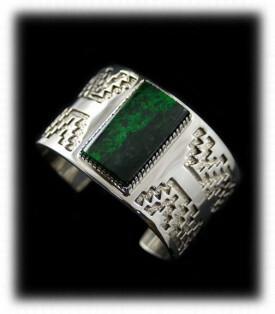 This Sterling Silver mens inlay bracelet is a beautiful example of Native American Indian Jewelry. To the right is a colorful pictorial inlaid Native American Silver Pendant handcrafted by Edison Yazzie, Navajo Artisan. 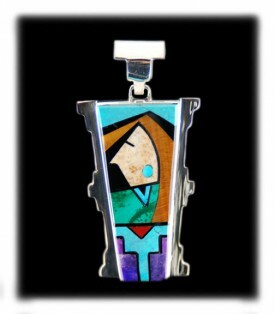 This Inlaid Pendant is beautifully designed and artistically executed by an accomplished Navajo Artisan. The design is of a Native American Woman with a mountain scene and by a river. This beautiful piece of Native American Indian Jewelry is inlaid with Turquoise, Sugilite, Jasper, Black Jade, Spiny Oyster Shell and Malachite. Durango Silver Company tries to always have several great pieces by Edison on hand at all times as we are in close contact with him. We invite you to take a look at a few of our other presentations - Native American Silver Rings, Native American Silver Jewelry, and there are many other informational pages located in our Native American Indian Jewelry Learning Center. We invite you to learn more about Native American Indian Jewelry and American Silver Jewelry by following the links in our Learning Center to other informational pages we have written on different topics directly related to Native American Indian Jewelry. In addition, we would like to invite you to join our E-Mail Newsletter - about once every other month we send out a Newsletter to inform our members of what's happening with Durango Silver Company, new products, specials for our members and more. 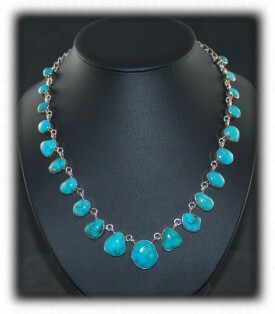 We also have a monthly drawing from our member base to give away Free Turquoise Jewelry from our company. Please take a moment to become one of our friends by signing in below. We hope you have enjoyed our presentation on Native American Indian Jewelry and have gained some useful knowledge from it.